For someone who stresses about messing things up, kintsukuroi is a beautiful and liberating concept. Celebrating flaws. Highlighting history. I’m trying to apply this to various areas of my life. Writing, family, home ownership, and most importantly, myself. Revision. Tension and conflict. Repairs and renovations. Frustration, impatience, disappointment. These are cracks in the clay, yes, but they need not be a cause for despair. They can be lined with gold and re-joined. Made to shine. They can add distinction and strength. What breaks the thing can also be what makes the thing. Beautifully written. I think this is the idea of wabi-sabi too, that beauty is in the imperfections, and if it were perfect, it would not be unique. Immediately after reading this I went searching for a blog entry that actually mentioned this concept. I remember reading about this and it blew me away, thank you for reminding me of this beautiful concept. In Japan there is a kind of reverence for the art of mending. In the context of the tea ceremony there is no such thing as failure or success in the way we are accustomed to using those words. 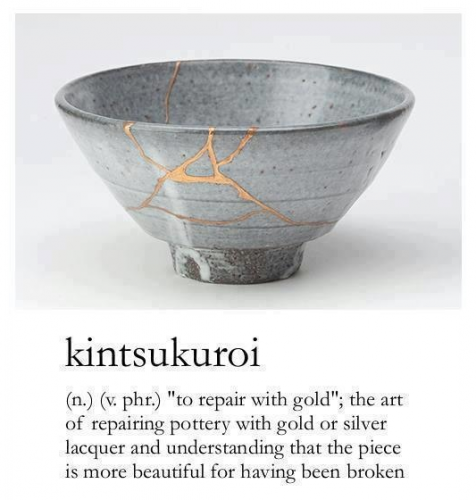 A broken bowl would be valued precisely because of the exquisite nature of how it was repaired, a distinctly Japanese tradition of kintsugi, meaning to “to patch with gold”. Often, we try to repair broken things in such a way as to conceal the repair and make it “good as new.” But the tea masters understood that by repairing the broken bowl with the distinct beauty of radiant gold, they could create an alternative to “good as new” and instead employ a “better than new” aesthetic. They understood that a conspicuous, artful repair actually adds value. Because after mending, the bowl’s unique fault lines were transformed into little rivers of gold that post repair were even more special because the bowl could then resemble nothing but itself. Here lies that radical physical transformation from useless to priceless, from failure to success. All of the fumbling and awkward moments you will go through, all of the failed attempts, all of the near misses, all of the spontaneous curiosity will eventually start to steer you in exactly the right direction. Yes, precisely. Thank you for sharing that elaboration, as well! It makes me think of guitars, and musical instruments in general. They get worn from use, and you can have them refinished and repaired, but for many, especially for those musicians who have played the same instrument for decades, those scratches and places where the bare wood shows through are the history — that this was used, not kept in a display case somewhere. The surgeons in the emergency room put my foot and ankle back together with metal. Although I’m pretty sure it isn’t gold. Still, repair and reuse. It works in many contexts.